Want to use your skills to aid in the development and maintenance of GNU projects? Here are four more projects that could use your help. This article is a continuation of my last article on GNU projects that are in current need of maintainers. When I first read about the projects GNU needed help with, I was drawn to Gnubik from my own personal love of Rubik’s Cube puzzles. I ended up liking the program and wanted to help so I reached out to the maintainer, who replied back asking about my background and letting me know where help was needed at if I was still interested. Since then, I’ve slowly been helping out where I could and enjoying learning more about the code behind the program. I’m hoping that by writing about these projects, someone will have the time and skill set to help out that wasn’t aware of these projects. I also hope that even if people can’t help out they will download the software, try them out and maybe end up like me. Gnubik: This GNU project brings the classic Rubik’s Cube to life on your GNU/Linux machine. Written in C and Guile, Gnubik also leverages OpenGL. If you are looking to learn more about computer graphics or how OpenGL works, I encourage you to reach out to John Darrington, who is the current maintainer of Gnubik. Some other cool features of Gnubik is that it supports cubes of any size, can use images or custom colors for the sides of a given cube, users can watch the cube solve itself, and you can record and playback your moves for a given sequence of moves. There is only one email for Gnubik that is used for all aspects of Gnubik, so if you are interested and want to help out, email bug-gnubik@gnu.org and tell them a little about yourself and your background to see if you could be a fit for becoming a co-maintainer. MetaExchange: The GNU Metadata Exchange Utilities is a GNU project used to make working with metadata easier and more meaningful. MetaExcahnge is used to pull metadata from servers, write that metadata to a database, and then present that same metadata in human-readable form. There are several different protocols constructed for retrieving data from a server and the two that MetaExchange is currently using are Z39.50 and OAI-PMH. MetaExchange aims to work with more server protocols in the future, as well as process records in USMARC format. If you would like to co-maintain and your skill set aligns with SQL, C++, and server communication protocols, then send an email to maintainers@gnu.org and let them know about your interest in the GNU Metadata Exchange Utilities project. PowerGuru: GNU PowerGuru allows a user to interface directly with power generation products that are used for renewable energy. PowerGuru can poll meters and write the data to a database, enables a user to remotely control a device, easy setup for new installations, 100% free software, and also has SNMP support to allow for easier network integration and administration. Currently, PowerGuru supports only devices by Xantrex and Outback Power Systems, but future work for PowerGuru is to increase the number of supported devices and companies. PowerGuru is currently being maintained by Rob Savoye and is looking for a co-maintainer to help with the workload. If you would like to find out more about PowerGuru and how you could become a co-maintainer, email maintainers@gnu.org and let them know your interest in the project. One thing to note would be that PowerGuru is a FSF copyrighted package, so future maintainers must need to keep up and help maintain that copyright in the PowerGuru papers. 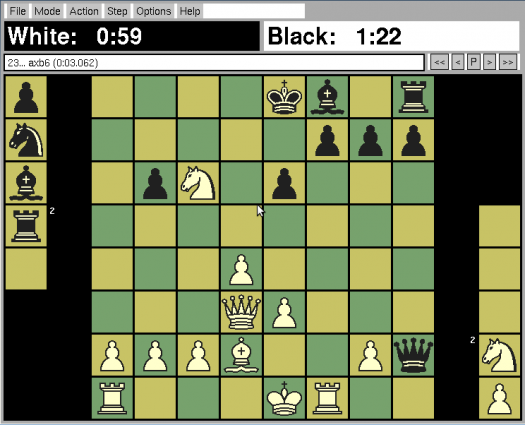 XBoard: This GNU project allows users to play chess in every form possible, such as Chinese chess, Japanese chess, Losers Chess, and Capablanca chess. XBoard contains many great features that make it a stand out chess program, such as an engine that will help analyze moves, servers that allow you to connect with friends and play chess, and correspondence chess played through email. Along with co-maintaining, XBoard is looking for help in several different areas: a new project admin is needed, translators to support new languages, testers, GTK developers, and updates to documentation. If you are up to the challenge and would like to assist with helping out or co-maintaining XBoard, email either maintainers@gnu.org or xboard-devel@gnu.org.